Boeshield is another good choice for rust prevention. Unless you are storing them in the rain, I would think that even a coating of motor oil would fend off moisture for quite a while. Gear lube is pretty sticky but would still be easier to clean off than axle grease. It's also easy to find, though a JD dealer can't be too far away either. That Boeshield looks a little pricey! I didn't make those recommendations lightly. simple motor oil/gear oil would be fine, if you are bagging the parts and storing them in a semi-controlled enviroment. For longer term, coat the critical areas with something like wheel bearing grease before bagging. we used to store parts in alcohol, or paint thinner. Just let them sit submerged in a sealed jar. a crank and a cam would require a pretty big jar. I've used LPS-3 and really liked it and the spray application is handy. How does Fluid Film compare? I haven't used Fluid Film but it looks very promising from what I've seen. It's lanolin-based. Ever see a rusty sheep? 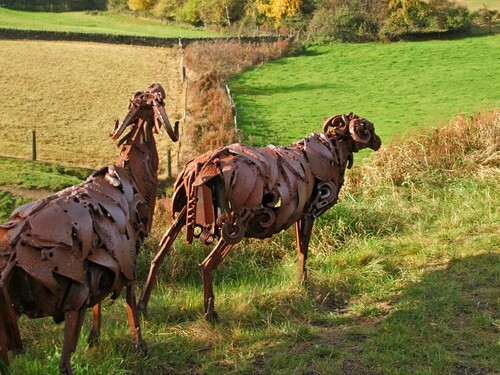 Ever see a rusty sheep?